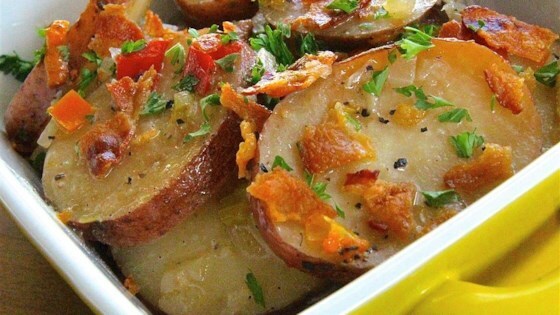 "I tried this recipe for some friends who had requested my German potato salad. I didn't have time to make in on the spot so I gathered my ingredients and put it in a slow cooker. They loved it!" Combine potatoes, onion, celery, green bell pepper, oil, vinegar, salt, and pepper in a slow cooker. Cook on Low 5 to 6 hours. Garnish with bacon and parsley. Very vinegary but otherwise bland. I would not make as directed again. Great hit. Used red potatoes and added extra garlic and salt. Everyone wanted the recipe! I've made this before, it's SO good. The original recipe doesn't call for bell peppers.